Orchards across Utah are bursting with late summer/early fall produce. From stone fruits like peaches to apples just ready to harvest, Salt Lake restaurants are now serving fresh fruit straight from the tree to your plate in bountiful supply. Here are four fruit-focused options to sweeten up your fall feasts. Tradition dishes up slices of glorious fruit pie in four varieties. 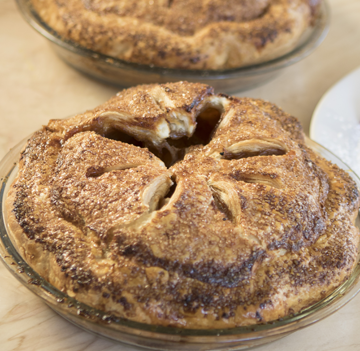 Dig into spiced cherry with lemon zest and a dash of cayenne; the caramel apple with brown butter Granny Smiths; a perfect cinnamon-marinated peach with fresh ginger; or the ginger berry filled with blueberries, blackberries and strawberries. Each flavor is nestled between buttery layers of crust and comes topped with fresh whipped cream or house vanilla ice cream for an additional $2. Whole pies in all flavors are also available. 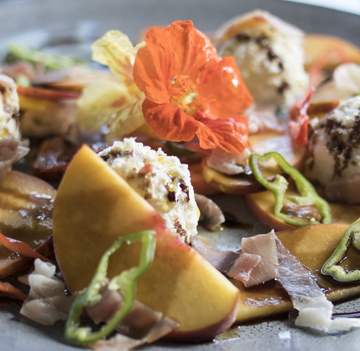 One of Meditrina’s recent nightly specials in rotation, this starter plate highlights peaches, shishito peppers and nasturtium—all grown right in Meditrina’s own organic garden. Adding depth are a creamy housemade ricotta, savory prosciutto and a tangy pomegranate balsamic reduction. It’s garnished with a pop of Maldon sea salt—enhancing individual flavors and bringing a delicate richness to the plate. A subtle smokiness seems to float over this summertime appetizer at Provisions in Millcreek. 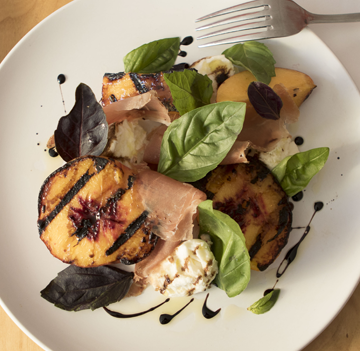 Featuring smoky speck and grilled peaches from Allred Orchards in Provo or other local fruit stands, the salad also highlights fresh basil from Frog Bench Farms and Caputo’s burrata. Drizzled with a high-quality olive oil and balsamic reduction, this dish is as visually stunning as it is delicious. 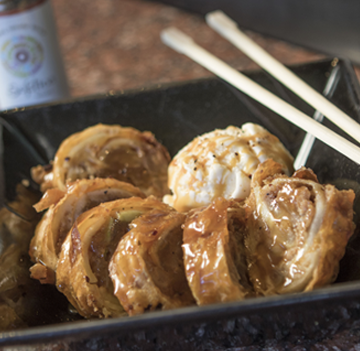 From the eminently creative Sushi Groove comes this kicky dessert roll. The Toasted Granny is filled with locally sourced sautéed green apples and graham cracker crumbs wrapped in fresh and tart apple slices and tempura-fried. Accompanied by vanilla ice cream and topped with caramel sauce spiked with chipotle from Solstice Spices, The Toasted Granny rolls out both heat and sweet on Highland Drive.